Click Resources dropdown from top left. Select the resource name and it will provide you that user specific information only. On top of the screen, you will be able to see the name of selected person, his/her profile picture, status, last login details etc. After that, you will be able to see count of assigned projects, open milestones and open tasks of that person. Underneath this, there are different types of reports available related to the selected resource. Projects: In projects report, you will see the list of projects assigned to the selected user along with the number of milestones and tasks, assigned to him/her, that are open. By default you will be able to see 10 projects in which one has most number of open tasks. You can always use the filters to see a more precise reports. Burn-up chart: It tracks the total tasks assigned to the resource versus completed tasks. You can also use filters like category and projects in order to view specific results. Milestones: Under milestones report, you get the list of milestones assigned to that user as per their due dates. You can also find the information regarding the date on which that milestone was completed, along with its status and name of the person who completed that milestone. You can also sort and filter the entries to get the desired results. Overdue tasks: This report tells you about the number of overdue tasks that one has in each project assigned to him or her. By default you will be able to see 10 projects which have most number of overdue tasks. You can also use filters to get more precise report regarding the overdue tasks. Time logged: In this you will be able to view the time logged by the selected person in all the projects that have been assigned to him or her. In it you can see the amount of time recorded by the person on timesheet and task. By default you will be able to see 10 projects in which the selected person has recorded the most time in its timesheets. 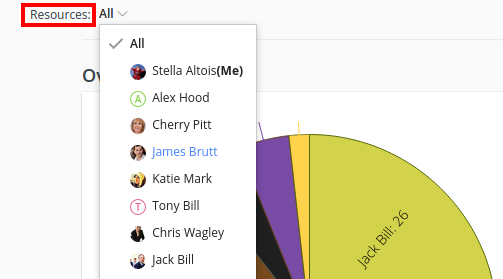 You can also use filters to get more precise reports regarding time logged by the person.